On November 13, 2016 we were able to honor veterans — past and present — and re-dedicate the American Jewish Veterans Memorial. We’d like to share a couple moving speeches from that day. “There is no question in my mind that today, no one doubts either the fighting qualities or the military leadership abilities of the American Jew, many of whom have reached the pinnacle of their respective service component. 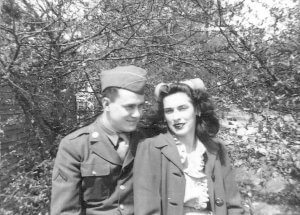 “My father and his fellow Jewish War Veteran Post 58 colleagues had dreamed for many, many years of this tribute to all Jewish men and women who served in our Nation’s military. They talked about it incessantly. Over the years several attempts at funding fell through and eventually the concept just faded away. But not in Alex Adler’s mind. The thought never left him. I know my father is here with us today in spirit and is thrilled at this new, more visible and enhanced location for this memorial. And he, his two daughters and son-in-law are full of gratitude to JWV Post 692, the Bender Jewish Community Center, his own Post 58 and the many individuals who came together to make this possible. We just re-dedicated the American Jewish Veterans Memorial! Cement your place in history and add to the Wall of Honor or Remembrance Walk Program, located in front of the Bender Jewish Community Center of Greater Washington in Rockville! A plaque on the Wall of Honor or a paver on the Remembrance Walkway makes a wonderful memorial, birthday or holiday gift. It’s a great way way to honor a family member, memorialize a loved one, friend who has served, is serving, or plans to serve in the Armed Forces of the United States, or to acknowledge your Post or Auxiliary. NOTE: Character limit is 16 for all upper case inscriptions and 20 for mix upper & lower case. Spaces and punctuation count as characters.